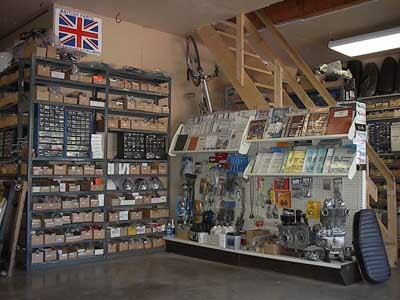 The closure of a local British motorcycle shop and the purchase of the remains of the Nicholson Bros inventory was the start of MOTOPARTS INC. in November 1995. Working from a cramped but orgainized 2,000 square foot building the company has new parts inventory of about 9,500 part numbers and tons of used spares. Since 2004 MOTOPARTS has offered full service, welding and machining, wheelbuilding and most aspects of restoration from component rebuilding to ground up restorations. Two people make it all happen. Nick Oland is handling sales and website management. 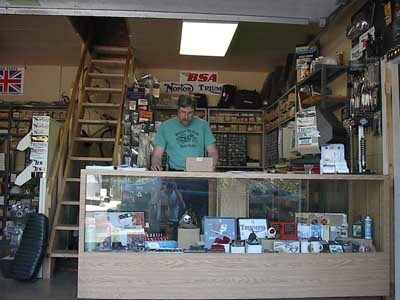 John Oland handles parts sales and is the voice you will likely hear when you telephone us. We also have a very competent group of associates who richly complement our business and our ability to serve you. Are you frustrated by the editorializing and opinions that pass for fact on the Internet? You are very welcome to call or email us with your British motorcycle questions. 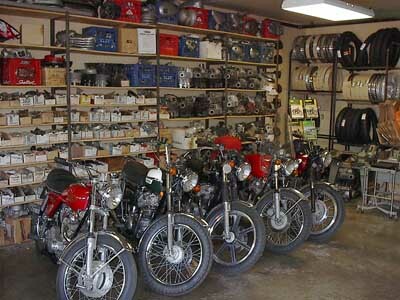 Our business is British motorcycles and we need to sell parts and service to continue. Our passion is British motorcycles and we are more than willing to share our knowledge and experience with you.